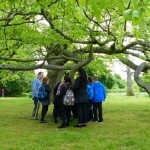 Home Botanical education That was FoPD (and #BotanyLive), that was! 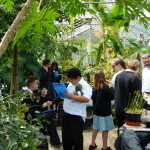 After the success of our monkey puzzle Fascination of Plants Day two years ago (check the link here) Dr M and colleagues have done it again, they ran another Fascination of Plants Day event at the University of Reading in the beautiful Harris Garden and tropical glass house. Plus, a first for 2017, they took part in the first ever #BotanyLive event! Organised by Anne Ostereider from Oxford Brookes University. Using the Periscope app on smartphones or tablets, #BotanyLive enables groups to live stream their FoPD event to the world. The videos can be saved and held on the botany.live website for viewing or other use after the event, such a great idea to spread the botanical words of wisdom! 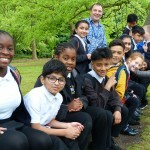 At University of Reading Dr M and colleagues welcomed a group of year 6 pupils from Oxford Road Community School and their teacher Mr Lyford. Around 30 pupils arrived by bus then foot at the Harborne Building School of Biological Sciences at 10 am sharp as arranged. There was a short welcome from Dr M and then the school group was skilfully divided into two and each was asked to come up with a plant as a group name, after much discussion the teams named themselves the four-leaved clovers and the Venus Fly traps! Dr M and his colleagues Dr Alastair Culham and Mr Oli Wilson then ran three activities and the two groups alternated between the three tasks over 2 hours or so in the glorious sunshine weather, especially pre-ordered (at considerable expense!) by Dr M! 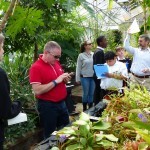 He then asked the children to select one, read the label to see the country of origin and then search the greenhouse (which is laid out in biogeographical regions) to find the plant from which it comes and then make some notes and to draw it. In this way they could see and learn the sources of the various plants and their products. When the task was completed Dr Alastair Culham concluded that often the things we eat bear little resemblance to the original plants or plant products, for example ground spices or even whole spices offer no clue as to the form of the parent plant! There can be other surprises too, for example many were amazed to learn that the pineapple grows on a bush not a tree and each bush produces just one pineapple per year and requires a square meter of space, so a lot of space is needed to grow all the pineapples eaten in the world – fascinating! 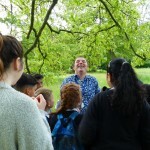 Task 2 was run by Oli Wilson in the lovely outdoor classroom that is the Harris garden on the UoR campus, and all about what plants have I used today? 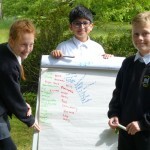 Oli asked the pupils to list all the plants they know and could write down in 2 minutes, these were written down on the flip chart and the task continued by discussing all the plants and plant products which are in our food and other aspects of our lives such as clothing and buildings. Oli wrapped up with a final tot up of number of plants used in a day and emphasised how much plants are essential to all aspects of our lives! Task 3 was run by Dr M and based in the lovely Harris Garden and revolved (sometimes rather loosely!) around the question: how many plants are there? 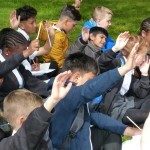 The pupils soon spotted that the question (and answer) is very different depending whether we are asking about plant species (maybe around 400 000 in the world) or about individual plants (countless millions!). 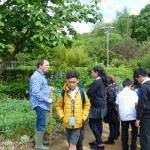 Pupils then were shown plants growing in the beds and picked and felt the leaves and thought and discussed how some plants grow by branching (making it very difficult to count individual plants which can grow in amongst each other in a dense patch) while others grow as solitary stems (where it is much easier to count individual plants). Dr M concluded by noting the amazing diversity of plants in the Harris Garden and in the world and how beautiful, fascinating and important they are! After the tasks were completed all assembled together for the #BotanyLive session! The excitement built as pupils wrote down one fascinating, weird or wonderful fact about plants they learned during their visit to University of Reading on Fascination of Plants Day. Then the Periscope app was turned on and we were streaming live to the world from the Harris Garden at the University of Reading! 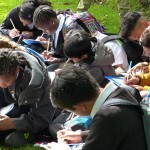 The assembled throng shouted “Hello Botany Live!” and Dr M made some introductory welcoming comments and then Dr Alastair Culham panned the #BotanyLive phone camera around each pupil in turn focusing on their fascinating facts written on their clip boards and inviting them to explain their chosen fact. But all in all this really showcased an impressive collection of fascinating facts for the very first ever #BotanyLive session! Dr M sums up: We can all agree plants are fascinating, plants are beautiful, plants are weird, plants are interesting, plants are cool and plants rule! A world without plants is no world at all! 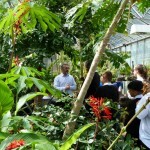 Plants are not just for fascination of plants day, plants are for every day of all our lives! 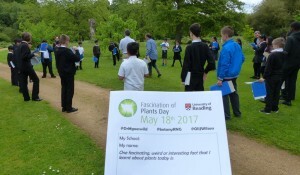 So finally thank you all for taking part in our Fascination of Plants day at University of Reading. Let’s all remember to say thank you to a plant every day! Dr M says: Check out our #BotanyLive video here!